It's no secret that participation in the Visitor Studies Association (VSA) has been critical to my professional success. My involvement began in 2014 when I received a student scholarship to attend the conference and present a poster on some evaluation conducted while still a student. I've attended and presented at every conference since then. The conversations I've had at this annual convening and the people I've met have helped me identify the kind of practitioner I want to be for myself, my clients, and the field. Ways art installations designed for family audiences can support caregivers and early learners. If you attended any of the aforementioned sessions or poster presentation - thank you. I hope it was worth your precious conference time. If you were unable to attend, but are interested in discussing those things, read on! This recap is for you. PS - The conference theme was "Fostering Transparency," so those buzzwords are going to be repeated often below. Getting ready to air my dirty laundry in front of my peers. Have you ever effed-up at work? Like... you underestimated something or someone... or misunderstood a delegation of responsibilities... or forgot how internal culture/politics could impact your efforts... or get so excited by one small part of the project you lose sight of the overall goals? No? Me neither. I only did one of those things. The rest were my co-panelists on a session all about owning the word FAILURE! The value of learning from failure is undeniable. Reflecting on and sharing our failures fosters transparency and has been described as the key to innovation. Despite this acknowledgement, embracing this concept in our field or in our individual practice is still not common. This session sought to open honest, and lively dialogue about our professional failures. We balanced personal presentations of failure (complete with pictures and graphs), and asked attendees to join in discussion about challenges or barriers they may face towards in a project's success. In the spirit of celebrating failure, we tried to get attendees to participate in a lively, informal activity where they shared their own professional blunders. That last piece was almost a flop in and of itself. We were reminded that talking about failure publicly also puts people in positions of vulnerability in front of their peers. I admit to feeling self conscious during the session. In fact, I eventually felt the need to clarify that I am a competent and qualified evaluator... who just really enjoys discussing mistakes I learned from. Though the room was packed with over 50 attendees, only two brave souls participated in our game to share tales of failure. Both of those individuals were deserving of the "Ultimate Failure" title, but only one won the coveted gilded clipboard. Jason, our fearless facilitator, did not get the cream top and black pants memo. Career timelines, proving there is no direct or easy path to visitor studies. "We are not experts." This statement kicked-off a roundtable conversation about how transparency between museums and communities begins with transparency internally among practitioners. It acknowledged the important role emerging professionals - defined as anyone, regardless of age, education level, or tenure in the field, who retains the spirit of professional growth - has in shaping the field of visitor studies. This idea also set the tone that everyone in the room had valuable experiences to contribute towards the conversation. Conversation began by highlighting how there is no direct path to visitor studies. We stressed this by sharing career timelines that we made. 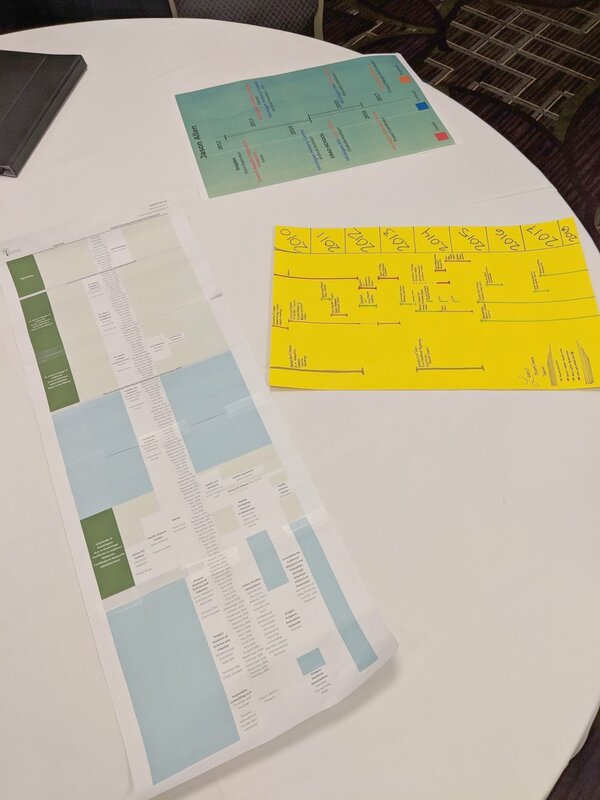 These maps demonstrated how our professional/academic/personal lives were each so different, yet everyone in the room could find something in them that resonated. Across our timelines were jobs held in museums and outside of them, times museums paid us, times museums didn't pay us, a reflection of how education provided or limited opportunities, as well as a listing of all the unpaid-volunteer opportunities we do in support of our own professional development. When talking about our timelines we were able to identify clear points in our lives in which we wish we knew more about the realities of discovering, growing, and staying in the field. And that is why, though not experts, we felt we could help facilitate an honest conversation on ways in which emerging professionals can grow the visitor studies field. Our roundtable went on to have rich conversations which followed the interest and needs of its participants. We discussed the value of mentorship and need to build community among peers. Seeking out and embracing critical feedback was also discussed. There was some conversation, too, on ways we can value ourselves as those who are growing in the field. This included strategies for advocating for yourself within an application process, or ways to amplify the value of work being performed through alternative dissemination means. The end result of this conversation was a list of ways - generated across conversation - that emerging professionals can invest themselves in the field and it's growth. The list was full of concrete, actionable strategies that individuals could chose to try or implement or advocate for. It also established a cohort of individuals who have deep interest in doing this work. Michelle Maghari, Director of Visitor Services at Crocker Art Museum, stands by our colorful, playful poster. If you know me or have been stalking my blog for a while then you have almost certainly heard me talk about Art Spots. They are incredibly cool site-specific art installations design with museum's littlest visitors in mind. Across 2017, the Crocker Art Museum installed several Art Spots as part of it’s Early Childhood Initiative. 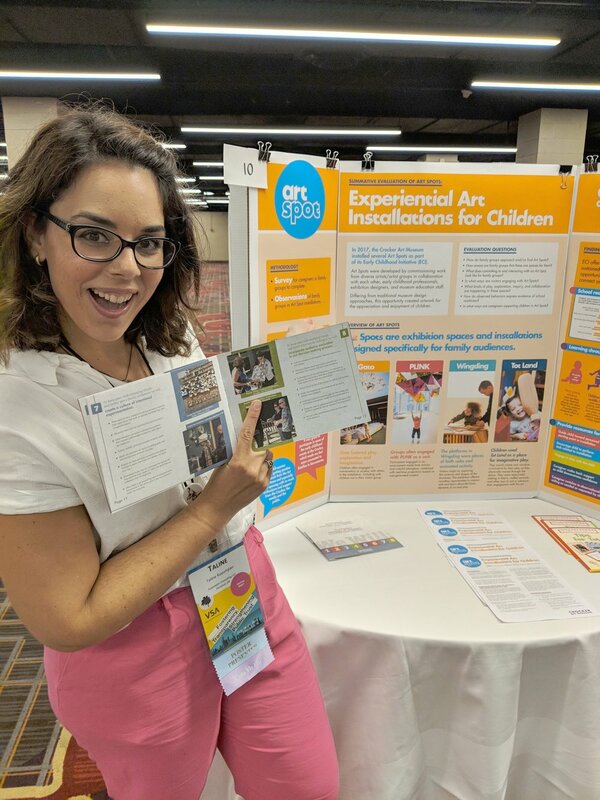 Art Spots were developed by commissioning work from diverse artists/artist groups and having them work in collaboration with each other, early childhood professionals, exhibition designers, and museum education staff to design their installations, with a full appreciation for early learners. Summative evaluation of these spaces concluded in June 2018. This poster discussed Art Spots through the lens of summative evaluation, which sought to understand ways youth and family groups interacted in the installations through observational studies. Surveys were used in the study to understand the extent to which Art Spots fostered school-readiness skills. Also shared was a surprising element of the study - the ways in which the artists themselves were impacted! VSA attendees had a lot of great questions about the study. Some wanted to know if the creation of Art Spots will continue after the grant (YES!). Others asked about the impact these spaces had on the community (family groups are starting to view the Museum as a place for them!!). We also had rich discussions on the protocol design, use, and broader applicability. Very excited to be hyping Art Spots and to discover a picture of myself doing data collection is in one of our handouts. Bright, playful, and full of imagination! Things these two presenters have in common with Art Spots. Does this describe you, too?